Our coffee shop has undergone a make-over. No longer is the coffee shop in a small space just outside the cafeteria. 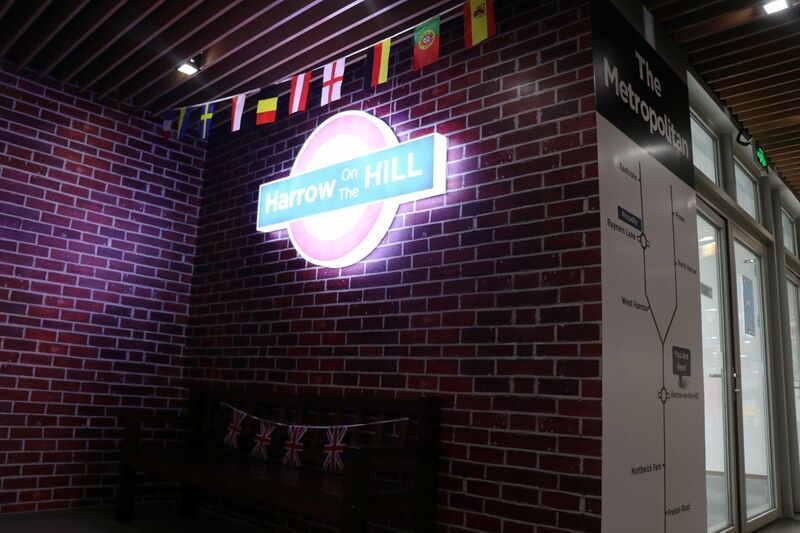 It’s now a very accurate manifestation of Harrow-on-the-Hill Underground station on the Metropolitan line. Hence the name ‘The Metropolitan’, for the coffee shop. But it’s authentic in every respect, with the red brick walls, the familiar underground sign and the line map, with the ubiquitous ‘You are Here’ legend. Outside the ‘station’ is another familiar English landmark, a red post box, originally designed by Anthony Trollope, a great author and, you’ve guessed it, Old Harrovian. We welcome parents and visitors to come and have a coffee at The Metropolitan, and enjoy a unique sense of being in Harrow, both school and London station. You can even post your suggestions on the school in Trollope’s post box!